Even before the election of Donald Trump to the presidency of the US, few members of civil society throughout Africa expressed a great deal of trust that the United States would fulfill its commitments regarding climate change. Data from a survey conducted in 2016 of members of the Pan African Climate Justice Alliance (PACJA) show that African organizations addressing climate change have little trust in the rest of the world regarding the reduction of emissions to maintain average global temperatures below 1.5 degrees Celsius – with the US receiving the lowest level of trust. In Figure 1 above, we see that a majority of PACJA members have low levels of trust for major emitting nations or regions, and trust of their own countries or the Sub-Saharan African region as a whole to sufficiently reduce emissions in order to limit warming to 1.5 degrees Celsius fails to reach a majority. Four out of ten respondents (41.5%) indicated that they trusted their own nations “quite a lot or a great deal” to reduce emissions. Of the high-emitting nations/regions included in the survey, the EU received the highest level of trust to reduce emissions with 31.3% of PACJA members surveyed indicating quite a lot or a great deal of trust. China and the US were afforded the least amount of trust, with only 20% and 16.7% of PACJA members surveyed respectively indicating they had high levels of trust for the nations. Reducing emissions is not the only thing in the current Paris Agreement. Climate finance is also part of the global negotiations as so-called developing countries seek assistance from the nations that have contributed the most historical emissions to the climate change problems we currently face. Figure 2, below, shows that there are slightly higher levels of trust regarding the provision of new and sufficient finance to help nations adapt to climate change compared to the sufficient reduction of emissions in Figure 1. Scandinavia (Denmark, Norway, and Sweden) is trusted quite a lot or a great deal by a majority (59.8%) of PACJA members to provide finance. Germany also is relatively trusted, although not by a majority (39.5%). The UK, France, Japan and the US, all receive low levels of trust from PACJA members. 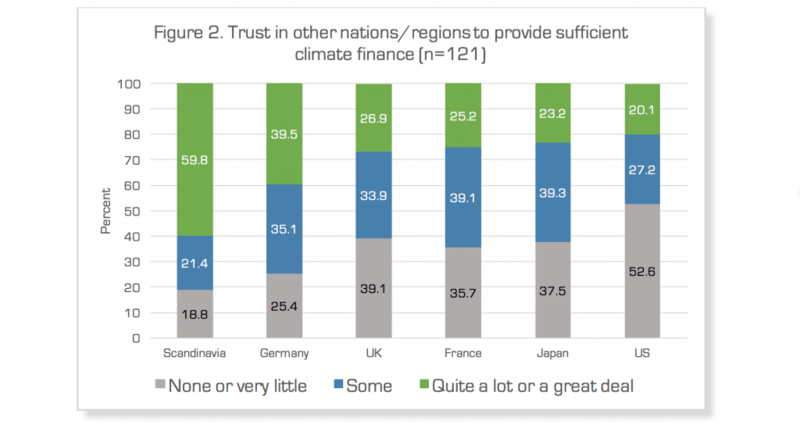 Only 1 in 5 indicate high levels of trust of the US to provide sufficient climate finance. Lastly, Figure 3, below, analyzes the level of trust regarding the transfer of technology from highly advanced industrial nations and regions in order to sufficiently reduce emissions. Similar patterns of trust as seen in the provision of finance are evident. Again, Scandinavia is the most trusted region, with 64.7% of PACJA members reporting quite a lot or a great deal of trust that Scandinavia will provide sufficient transfers. The US remains a laggard, with only 26.1% of PACJA members affording the nation high levels of trust. More than half have very little to no trust of the US in this regard. Trust is essential in international relations. Successfully addressing climate change on a global scale requires nations and civil society actors to work together to implement mitigation and adaptation projects at every level from the local community to the transnational. The existing “trust gap” needs to be closed through concrete actions by high emitting nations led by the state. This trust will be further tested with the election of Donald Trump, who has referred to climate change as “made up”, included withdrawing US commitments of climate finance in his “First 100 days” plan, and has indicated a desire to revive the waning coal industry. None of that is good news for global climate change or increasing the level of trust of the US to take sufficient action. As Trump-Pruitt-Tillerson withdrew the US from participation in the Paris Agreement this mistrust has proven appropriate. *This data comes from the 2016 PACJA member survey of civil society actors throughout the continent. Data was collected from a random sample of current PACJA members in March and April of 2016. Respondents represent 36 countries. This is entry is drawn from a larger report written with Mithika Mwende, Secretary General of PACJA. Contact the author, Todd Beer, with interest in the more complete report.